Home » Answers to Jehovah’s Witnesses » Is loyalty to an organization necessary for salvation? Is loyalty to an organization necessary for salvation? Summary: The Watchtower Bible and Tract Society claims not only that one cannot understand the Bible correctly apart from the Watchtower publications, but that one cannot be saved without loyally participating in and supporting the Watchtower organization. The Watchtower Society claims not only that its instruction is necessary for proper understanding of the Bible (as we saw in the previous article in this series), but that loyal participation in the religion the Society leads is necessary for salvation. This idea is usually expressed by saying that an individual must associate with God’s “organization” in order to be saved. How Were People Saved before the Watchtower Society Existed? An obvious difficulty with the claim that salvation is contingent on faithful, loyal support for God’s “organization” on the earth is that Jehovah’s Witnesses’ organization has existed for less than two centuries. Between the end of the first century and the end of the nineteenth century, there was no religious organization on earth that Jehovah’s Witnesses recognize as having spoken for God or taught the way of salvation in truth. That period of about 1,800 years was a period of apostasy during which true religion was all but extinct on the earth. Watchtower theology acknowledges the existence of individuals and small isolated groups of genuine believers during that period of apostasy prior to the formation of the Watchtower Bible and Tract Society, but not of any faithful organization on earth to which such believers could be attached. So how could people living before the Watchtower Society existed have been saved? One possible answer a Jehovah’s Witness might give is that during the period when was no organization on earth representing Jehovah, he did not hold people responsible for not being associated with such an organization. Such an answer would miss the point. If an organization was not necessary for people’s salvation for the 1,800 years of the worldwide apostasy, there is no plausible reason why it would be necessary now. You need to understand the Bible correctly to be saved. You cannot understand the Bible correctly without following the organization’s teaching. Therefore, you cannot be saved without following the organization’s teaching. In context, the Ethiopian was reading the Old Testament passage about the Suffering Servant (Isaiah 52:13-53:12). Luke tells us this and specifically quotes Isaiah 53:7-8 (Acts 8:32-33). Isaiah’s prophecy did not, of course, give the name of the Servant but was a prophetic picture of what he would do hundreds of years later. What the Ethiopian needed was to know who Jesus was and how Jesus had fulfilled the redemptive promise revealed in Isaiah. As Luke tells us, “Then Philip opened his mouth, and beginning with this Scripture he told him the good news about Jesus” (Acts 8:35). We do indeed need some “publications” in order to have an accurate knowledge of the truth, but the publications that we need are the books of the Bible. In particular, we need the books of the New Testament in order to know how Jesus fulfilled the prophetic and redemptive expectations of the Old Testament. Everything we need to know about Jesus and how he fulfilled the Isaiah prophecies—everything that Philip might have told the Ethiopian that we would also need to know—is found in the New Testament. “The good news about Jesus” is the dominant theme of the New Testament writings. Far from supporting the Watchtower’s claim that we need to believe and support a religious organization in order to be saved, Luke’s account of the Ethiopian nicely illustrates why no such “organization” is needed. Philip preached Jesus to the Ethiopian; he did not preach an organization. He did not “direct” the man “to the organization” as soon as he began his “Bible study” with him, as the Watchtower Society instructs its followers to do. Philip baptized the Ethiopian and sent him on his way (Acts 8:38-39). We have focused attention especially on the second premise of the Watchtower’s argument—the premise that one needs the organization to understand the Bible—but we should also comment on the first premise. We do need to have an adequate understanding of the gospel—the good news about Jesus—in order to be saved (e.g., Rom. 10:9-10; Gal. 1:6-9). However, it isn’t correct to say that we need to have an accurate understanding of the Bible in order to be saved. This is a “requirement” the Bible itself never imposes. It is not necessary to understand the whole Bible in order to be saved. Nor is it necessary to have a correct doctrinal system with every point of doctrine or belief accurately understood in order to be saved. Doctrine is very important—more important than most people seem to think today—but it is not all-important or of ultimate importance to our eternal salvation. You do not have to get an “A” on a theology exam or a biblical studies exam in order to be saved. The Bible teaches that we are saved as a free gift of God’s grace and mercy through humble faith by the sacrificial death of Jesus Christ (John 3:16; Rom. 5:6-10; 6:23; Eph. 2:8-10; Titus 3:5-8). 1. 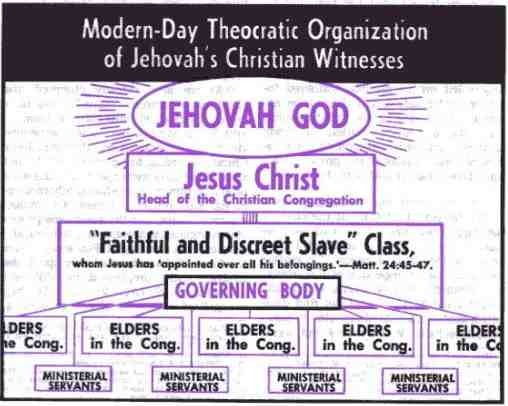 “Directing Bible Students to Jehovah’s Organization,” Kingdom Ministry, Nov. 1990, 1. 2. “God’s Rest—What Is It?” Watchtower, July 15, 2011, 28. 3. “Are You Moving Ahead with Jehovah’s Organization?” Watchtower, May 15, 2014, 29-30. 5. “From Our Readers,” Awake! Aug. 22, 1984, 28. 6. Robert M. Bowman Jr., “Do we need the Watchtower to understand the Bible? Answers to Jehovah’s Witnesses #3” (Cedar Springs, MI: Institute for Religious Research, 2017). 7. “Are You Receiving ‘Food at the Proper Time’?” Watchtower, Aug. 15, 2014, 4.